CORVALLIS, Ore. (AP) Oregon State was on a four-game losing skid and facing heavy criticism on social media and elsewhere, said coach Wayne Tinkle. ”Our backs were against the wall and this was a must win. Our guys knew it. And the neat thing is they ignored all the negativity that came from all over the place this week,” he said. The web will surely be a bit more positive, at least for a day or so. Drew Eubanks added 18 points, 10 rebounds and three blocks and Alfred Hollins had a career-high 19 points and four steals for the Beavers (12-11, 4-7). ”It’s one game, but we’re really excited with the way the guys came out and responded,” Wayne Tinkle said. Robert Franks had 17 points and six rebounds and Carter Skaggs had 11 points off the bench for the Cougars (9-14, 1-10), who have lost six in a row. With the game tied at 24-all, Oregon State went on a 20-0 run spanning the last four minutes of the first half and the first two minutes of the second half. ”There was turnover, turnover, missed shot, bad shot, turnover, and it was a 13-0 run (at the end of the first half) even with taking timeouts. . 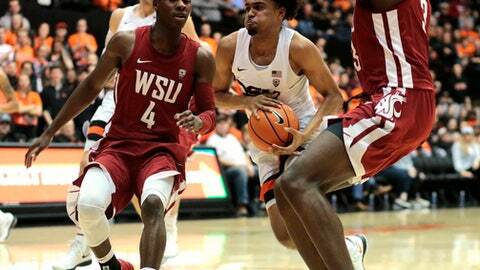 There was the game right there,” Washington State coach Ernie Kent said. Oregon State shot 57 percent for the game, compared to 38 percent for the Cougars. Oregon State led early, and Franks had Washington State’s first eight points. The rest of his team started the game shooting 0 for 8 and didn’t score until a Viont’e Daniels 3-pointer at the 9:41 mark trimmed the Beavers’ lead to 14-11. The Beavers surged ahead and led 37-24 at the half, with Stephen Thompson Jr. scoring on a reverse lay-in with two seconds left. Oregon State led by as many as 33 in the second half. Stephen Thompson Jr. finished with 16 points and six rebounds for Oregon State, while younger brother Ethan Thompson added 10 points, five rebounds and six assists. Washington State: Coming into Thursday, Washington State was winless on the road in the Pac-12 and had lost those games by an average of nearly 15 points. Oregon State: Seth Berger, who had started 17 straight games, missed Thursday’s game due to concussion protocol. He was injured in a practice this week. Hollins, a freshman, replaced Berger in the starting lineup. . With a dunk with 4:42 left in the game, Eubanks became the 41st Beaver player to get to the 1,000 point mark. He now has 1,001 career points. Wayne Tinkle pointed to Eubanks’ progression as a player on the night that the junior post made the 1,000 point club. ”He’s come a long way, he’s continued to work, he’s fought through some frustration,” Tinkle said. ”They definitely made it a lot easier for me to get there. Just really, really appreciative,” Eubanks said. Stephen Thompson Jr., the other current member of the Beavers 1,000 point club, was averaging 5.3 points in the first half of games and 11 in the second half before Thursday. He stayed true to form against the Cougars, scoring six in the first half and 10 in the second half. Franks wasn’t highly recruited out of high school, but the junior forward’s name is at the top of opponents’ scouting reports lately, Kent said. ”He’s having a wonderful season. . You can see his game just blossoming now,” he added. Washington State plays at Oregon on Sunday. Oregon State hosts Washington on Saturday.